In the last post we outlined the basic anatomy associated with the Liver sinew channel. If you have not yet read it, you might want to start with that post. In this post, we will discuss a common postural dysfunction associated with the Liver sinew channel, and we will look at common orthopedic conditions associated with this. Finally, we will discuss some treatment options. Keep in mind that many of these treatments are best learned in a class setting and that much of the discussion here will be alluding to these techniques. Others will be relatively straight forward and easily adaptable in your practice, however. Many of these patients present with Yaoyan syndrome (often referred to as Iliac Crest Syndrome in Western circles). This presents with pain at Yaoyan. 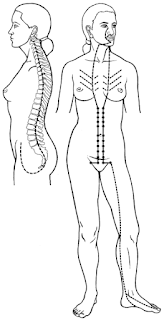 Yaoyan is level with the lower border of L4 and, depending on whether you palpate slightly more medial or lateral, will be more reactive at either the iliocostalis (the most lateral muscle of the erector spinae group) or the quadratus lumborum (QL) attachment at the iliac crest. 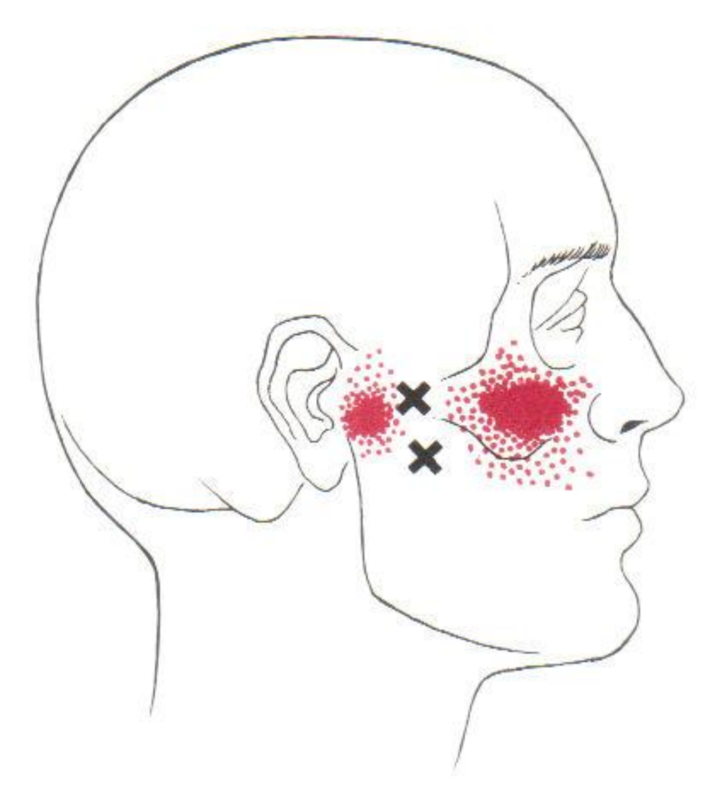 When there is pain with palpation of the QL, I frequently find LIV-5 to be very sensitive to palpation, also. Needling LIV-5 and obtaining Daqi often reduces the pain at the QL with palpation by about 50%. 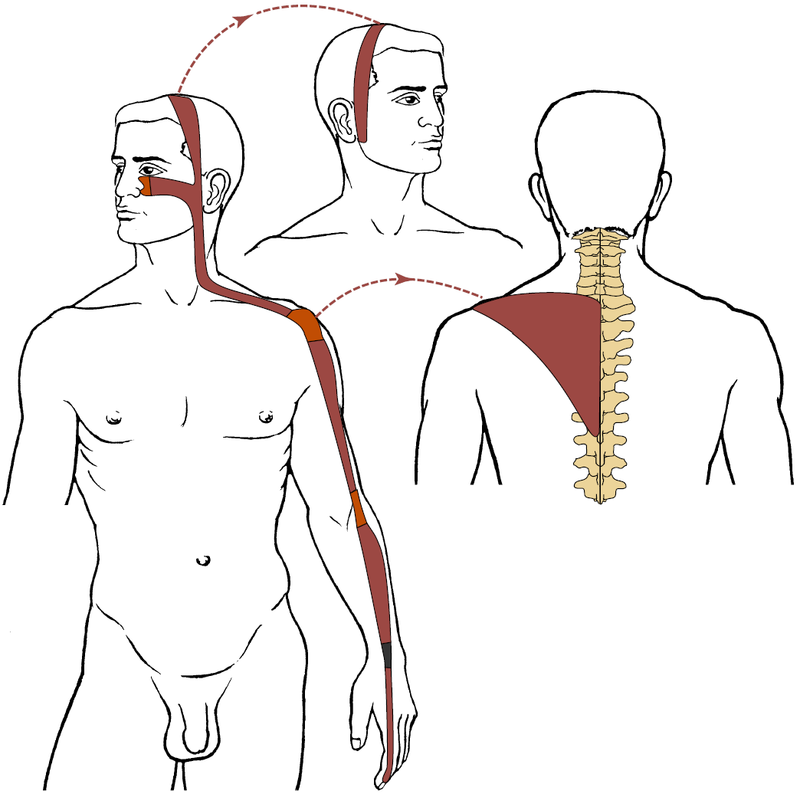 Another frequent pain condition which is seen with this posture is thoracic outlet syndrome (TOS) which involves an entrapment of the brachial plexus either between the anterior and middle scalenes, between the clavicle and ribcage, or between the pectoralis minor and the ribcage. In this posture, the scalenes and pectoralis minor are short and holding the ribcage too rigidly up (creating a very wooden spine). I associate these muscles with the Lung sinew channel, but see this as a way that excessive Liver energy can affect the channels associated with the Lung. These patients often have a paradoxical breathing pattern where they pull the abdomen in during the inhale and lift the chest. 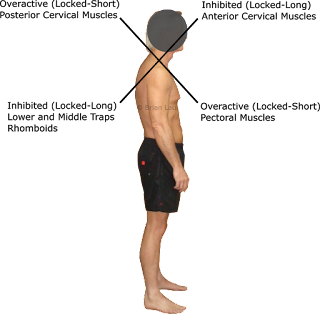 This uses accessory breathing muscles and they should be elevating the upper ribs, but with the restricted movement in the diaphragm, they have to work overtime; thus they become tight and rigid and can then compress neural structures. Fig. 3: Brachial plexus entrapment on the left side 1) between the ribcage and clavicle, 2) between the anterior and middle scalene, and 3) under the pectoralis minor. I include the scalenes and pec. minor in the Lung sinew channel. 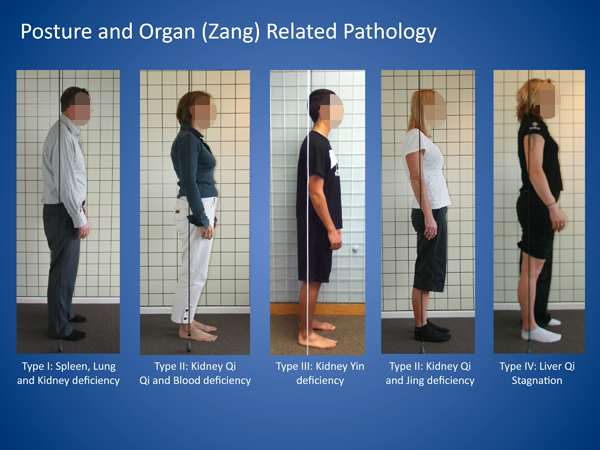 They are listed here as Liver Qi Stagnation and the posture shown above is a common contributor of TOS. Fig. 4: Anterior pelvic tilt. 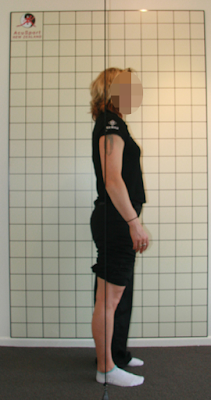 Since an anterior tilt of the pelvis is involved with the posture in Fig. 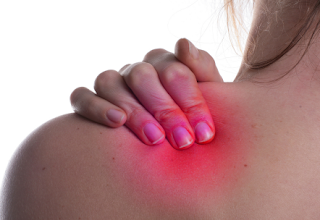 1, it is important to address this when treating many pain patterns, especially if they are chronic. In the Sports Medicine Acupuncture Certification program run by AcuSport Seminar Series, we teach a particular needle technique at LIV-4 (paired with GB 39.5) as treatment for an anterior pelvic tilt. This is used on the most anterior side and could be part of the treatment of many back conditions such as radiculopathy, facet syndrome, and SI joint dysfunction; it can also be used with treatments for TOS and other problems. This point combination and needle technique was developed by Matt Callison through his understanding of channel theory and then refined with trial and error. 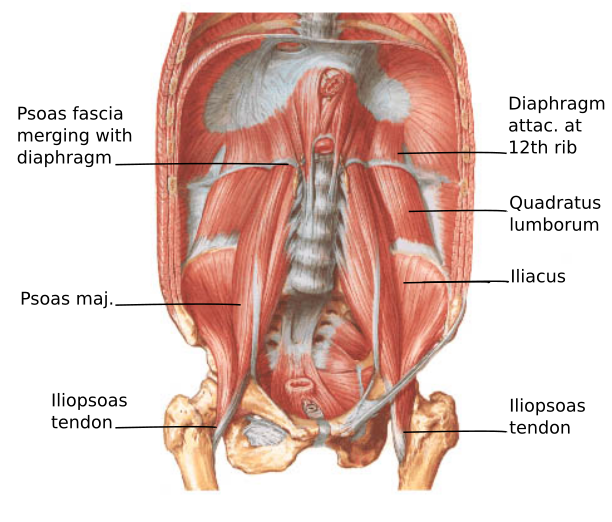 I interpret LIV-4 as softening the psoas and helping relax and lengthen this muscle, which is such a strong contributor to an anterior pelvic tilt. 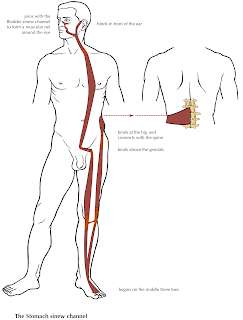 It is mentioned here to highlight the relationship of the Liver sinew channel to the psoas major, which is heavily involved with an anterior tilt of the pelvis. In addition to acupuncture to distal points, direct needling of motor points to muscles such as the QL, scalenes, pectoralis minor, and other related structures can help improve alignment. Also tuina is indicated. I utilize myofascial release extensively in my practice and it can be very helpful in releasing tight fascia and allowing the body to find a more healthful balance. In Sports Medicine Acupuncture and in the KMI training, Simone Lindner teaches a very useful myofascial release technique to the lateral raphe (a fascial structure which then separates to becomes the anterior and posterior layer of the thoracolumbar fascia). 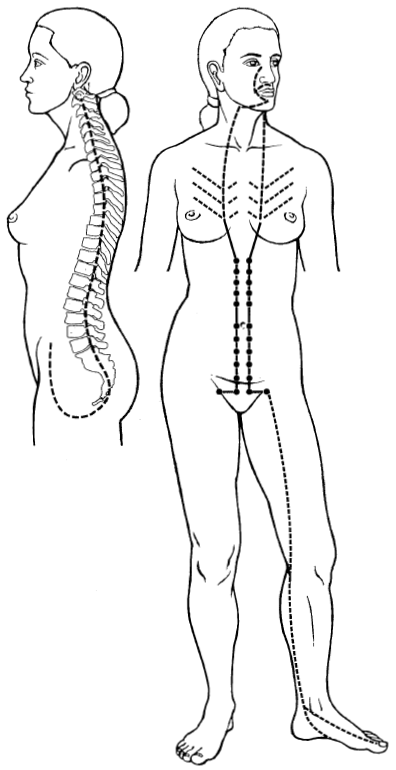 This structure is at the edge of the QL; the technique involves working with a seated patient and, using this fascial structure as leverage, lifting their ribcage out and away from their pelvis in the back. Also addressing the front of the diaphragm is useful as it is pulled up. 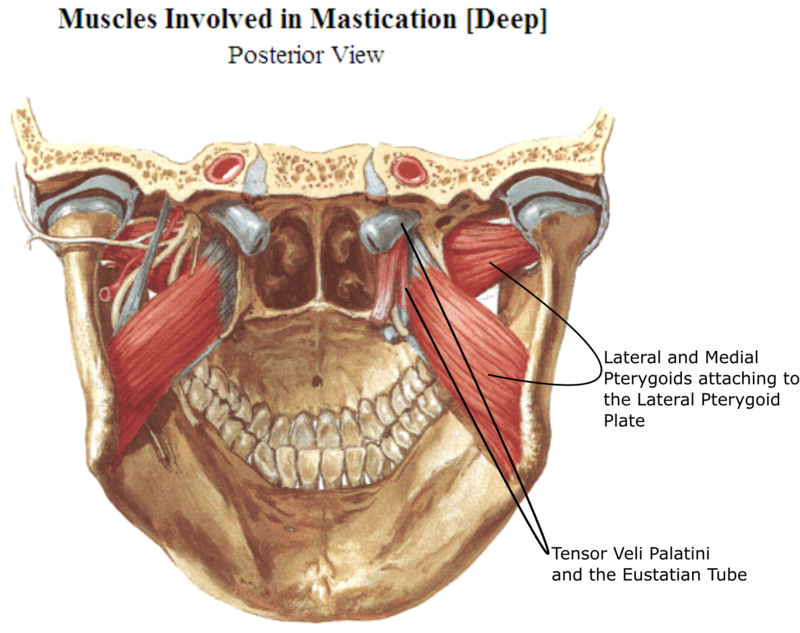 Accessing this fascia under the costal margin and bringing it down will free the breath and soften the Liver channel. Other sinew channels have a strong relationship to the diaphragm, either directly or indirectly, and can be explored at another time. 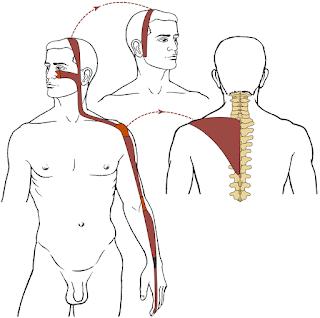 Most notably, the Pericardium sinew channel influences it via its relationship with the serratus anterior, another muscle which can act as a clamp and restrict proper expansion of the thorax. Needling SP-21 or other points which correlate with motor points of this muscle will increase the Lung pulse, for instance. The Lung sinew channel relates to the pectoralis minor and the scalenes (both discussed in this post) and has a strong relationship to the diaphragm in that these muscles are accessory breathing muscles and, when restricted, can greatly limit breathing. The Yang sinew channels also include many structures such as the abdominals and pectoral muscles that can limit expansion of the breath. Therefore, the diaphragm, with its relationship to effortless and healthful breathing, is one of those pivotal structures for vibrant health. 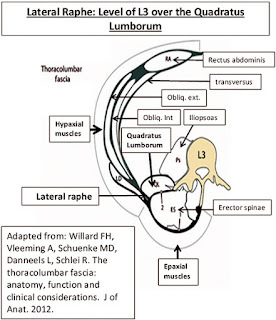 Note: Tom Myers has an interesting discussion on this fascial plane which I am categorizing as part of the Liver sinew channel. His post can be found here; however, it is not written from a TCM or Chinese medicine prospective. In the last post we discussed how the Spleen sinew channel connected to the anterior aspects of the diaphragm; we looked at dysfunctional patterns associated with this sinew channel and how this relates to breathing and posture. This post will look at the Liver sinew channel and the posterior aspects of the diaphragm. 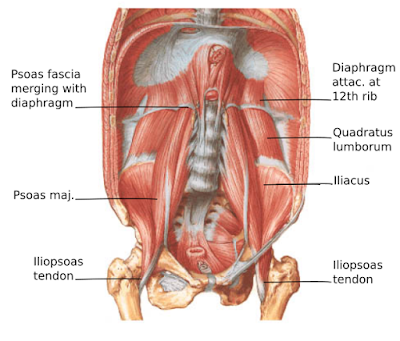 This connection is mediated through both the quadratus lumborum and psoas muscles as their fascia blends with that of the diaphragm. 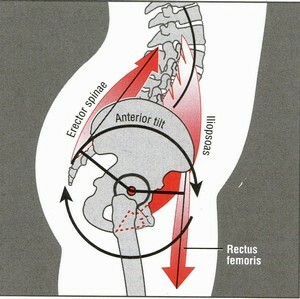 This occurs at the 12th rib for the QL and the superior portion of the psoas. Before getting to the diaphragm, let's look at the Liver sinew channel in the thigh and work up to its connection at the posterior diaphragm. 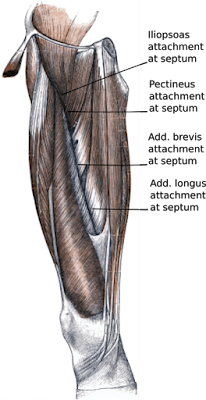 There are two prominent fascial septa in the medial thigh; an anterior septum which separates the quadriceps from the adductors, and a posterior septum which separates the adductors (primarily adductor magnus) from the hamstrings. The anterior septum is associated with the Liver sinew channel and links the more anterior adductors such as adductor longus, adductor brevis, and pectineus with the distal iliopsoas tendon. While the iliacus and psoas muscles (which together make up the iliopsoas) have a common attachment distally, each muscle takes a different, though similar, pathway as it moves proximally. 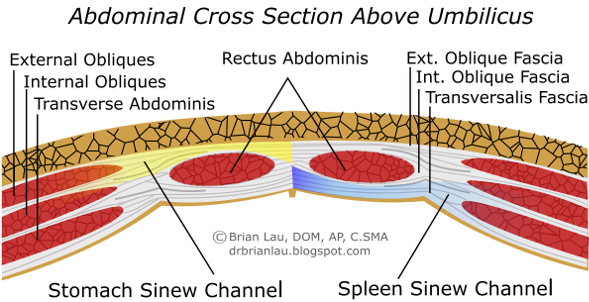 Posterior Abdominal Wall, from Netter's Atlas of Anatomy. Labels added to highlight Liver sinew channel. 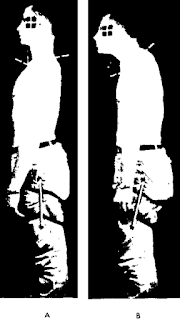 The iliacus portion attaches to the iliac fossa on the medial ilium. Its proximal portion at the iliac crest connects to the distal portion of the quadratus lumborum (QL). 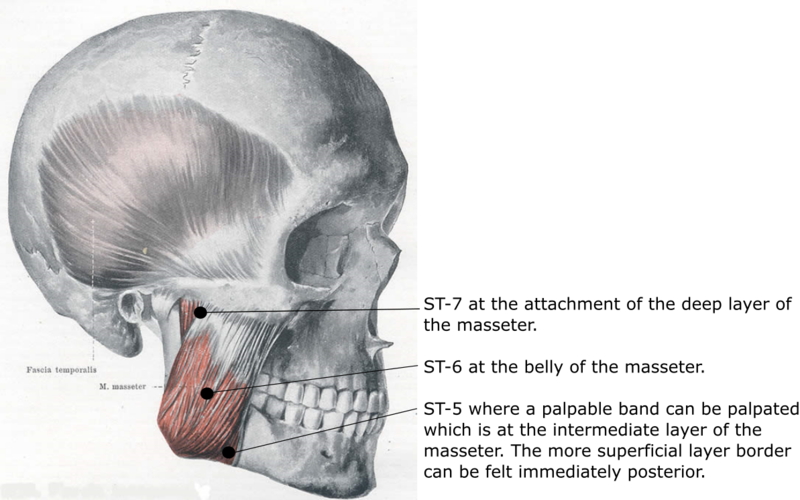 This places the QL on a direct fascial plane with the adductors and iliacus and makes it a much more Yin muscle in terms of depth and fascial connection. Other authors usually assign the QL to Yang channels, most often the Gallbladder, but occasionally the Urinary Bladder. Legge. Maciocia, and Kendall place it in the Gallbladder sinew channel. Whitfield Reaves has some interesting commentary in his book based on his struggles with this muscle and its channel relationships. He deems it too lateral to be easily assigned to the Urinary Bladder and too medial for the Gallbladder channel (he does not refer to the sinew channels, specifically). All of this is understandable, based on where it would be palpated and needled. However, I have become convinced that it more properly belongs in the Liver channel, based on the fascial plane it exists on; functional relationships it has with the Gallbladder sinew channel muscles such as the gluteus medius and minimus (this will be a future topic); and my own findings of consistent reactivity of LIV-5 to QL pain at Yaoyan (its iliac crest attachment), Pigen (its 12th rib attachment), or in the midbelly at its motor point (this will be discussed more in part 2 of this post). 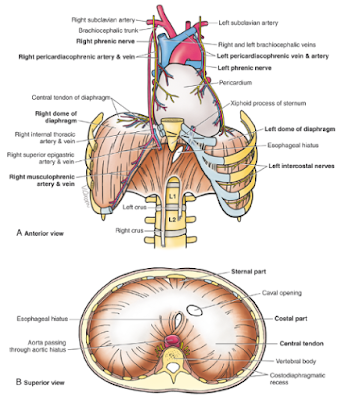 To continue with the fascial connection, the QL attaches to the inferior portion of the 12th rib, while a portion of the diaphragm attaches to the superior portion of this rib. However, the fascia between these attachments is continuous. This fascial connection can be illustrated with the scenario of an actress who has her 12th rib removed (an actual cosmetic procedure, used to reduce waist size). Neither the QL nor the diaphragm needs to be cut surgically. The 12th rib is cut away and the periosteum (containing both the QL and diaphragm attachments) is teased away from the rib. The rib is then removed and the QL-periosteum-diaphragm is kept intact. 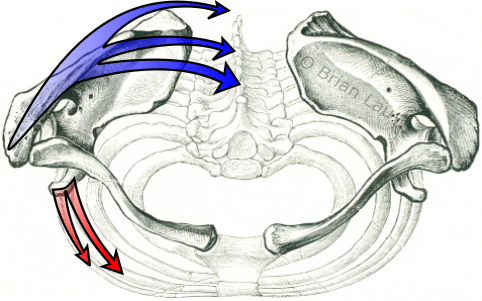 The psoas has a more direct pathway, covering the same basic territory as the QL-iliac muscle to blend with the fascia of the posterior portion of the diaphragm at its proximal end. In Sports Medicine Acupuncture®, we look at the cases where the too-tight diaphragm can impinge on and inhibit the psoas. This inhibition of the psoas destabilizes the back and leads to pain, which often comes on when the breathing is challenged during exercise. Matt Callison teaches a technique he developed to assess for this, and he treats it with a particular needle technique at ST-20. This assessment and technique is better left to in class training, but it is interesting that ST-20 descends both Stomach Qi (not surprising for an ST channel point in this region), but also descends rebellious Lung Qi. Could this be considered a case of Metal overacting on Wood, as breathing restrictions are inhibiting the proper firing of a Liver sinew channel muscle? To briefly restate the anatomy: this sinew channel follows the anterior septum of the thigh up the medial leg. This would include a series of fascially linked structures such as the adductor longus, the adductor brevis, the pectineus, and the distal iliopsoas. This would then branch at the iliopsoas, with one portion linking the psoas to the posterior diaphragm and another branch linking the iliacus to the QL to the posterior diaphragm. 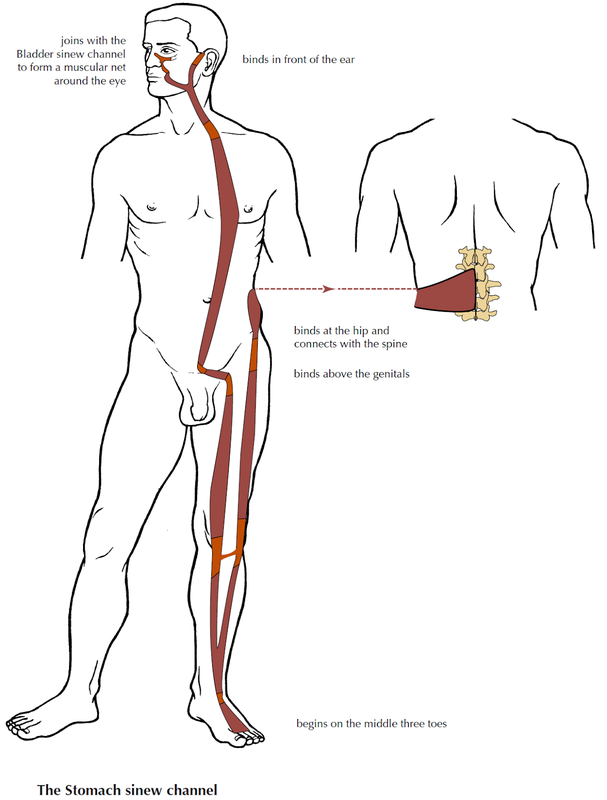 Note that classically the Liver sinew channel ends at the groin. However, I feel, for reasons described above and in future posts, that a strong argument exists for extending it up to the diaphragm. In the next post we will look more thoroughly at dysfunctional patterns associated with the Liver sinew channel and its connection to the diaphragm. We will explore various postural changes that can be observed (as we did with the Spleen sinew channel) and we will explore various pain patterns that arise. This is Part One of a post that will explore the sinew channels and their relationship to the respiratory diaphragm. 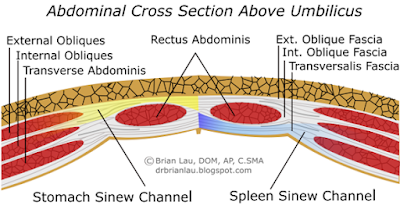 This post will highlight the Spleen sinew channel (and will also discuss the Chongmai). The next post will highlight the Liver sinew channel. The respiratory diaphragm is a large, complex and extremely influential muscle. Its unrestrained movement is essential for proper breathing. This involves not only freedom in the muscle itself for it to ascend and descend, but also freedom in related structures which, when restricted, can act as a clamp and prevent expansion of the abdomen and thorax. Structures such as the the abdominal muscles, pectoral muscles, serratus anterior, and certain cervical muscles are among those that can be particular detrimental to breathing when they are restricted. In addition, the visceral organs move with each breath, so freedom in the diaphragm requires good circulation and unrestrained mobility in the organs for proper response to the diaphragmatic movement. Cervical pain, low back pain, thoracic outlet syndrome, and hypochondriac and rib joint pain are just some of the many conditions that can occur with poor breathing due to dysfunction associated with the diaphragm. From a Traditional Chinese Medicine standpoint, the ascending and descending of the diaphragm is important as it regulates the ascending of Spleen Qi and descending of Stomach Qi. Vietnamese educator and Classical Chinese medicine scholar Nguyen Van Nghi described the acupuncture point BL-17 from this standpoint, indicating that the reason it was both the Back Shu of the diaphragm and such an influential point of blood production was tied to the fact that it regulated the upward and downward movement of the diaphragm, thus regulating the upward and downward movement of the Spleen-Stomach Qi mechanism, both being so integral to the production of blood. This and the next post will look at the relationship of the sinew channels to the diaphragm, especially those of the Spleen and Liver sinew channels. I have been exploring the sinew channels for about 15 years, first as a taiji and qigong practitioner, then as structural integration practitioner (the body of work that includes Rolfing) and then as an acupuncturist. I was not thinking about these directly as sinew channels when I practiced structural integration, but was very influenced by Tom Myers' development of Anatomy Trains as these seem to relate to the 'tendons' we referred to in our 'tendon changing' exercises in taiji and qigong practice. As I transitioned into acupuncture, I noticed a lack of description of these sinew channels and have been working to develop these more thoroughly. I feel there is enormous potential in having a more detailed anatomical knowledge of them, and in using this specificity of detail to inform clinical decisions. Much of this material is influenced by my practice first in structural integration and then in acupuncture, specifically through my work with Matt Callison and Sports Medicine Acupuncture®. This information is condensed from a lecture I have been giving in the certification program for Sports Medicine Acupuncture®. This primarily explores the sinew channels from the perspective of fascial planes, how these channels relate (internally-externally, six division, midday-midnight, five elements), and how they communicate proprioceptively through the fascia. Stomach and Spleen sinew channels. The first sinew channel to explore relating to the diaphragm is the that of the Spleen. Actually, it might be better to consider this as a pair involving the Stomach and the Spleen. As in much of Chinese medicine, the physiology of the Stomach and the Spleen sinew channels are very tied together. Often internally-externally related sinew channels have an agonist-antagonist relationship when looking at how they balance a particular joint complex. With the Spleen and Stomach sinew channels, they work much more together. We will look at the anatomy of these channels in relationship to the torso in this post. The fascia associated with the rectus abdominis muscle is particularly relevant to these channels. The fascia of the external obliques travels anterior to this musclel the fascia of the internal obliques bifurcates, half of it travels anterior, half posterior. The transverse abdominis travels completely posterior to the rectus abdominis. Note: this changes below a structure called the arcuate line, which is roughly in the region of Ren-6, at which point the rectus abdominis becomes deep to all of this fascia and continues to connect to the pelvic floor. Fig. 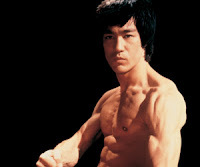 3: Image from www.brucelee.com. 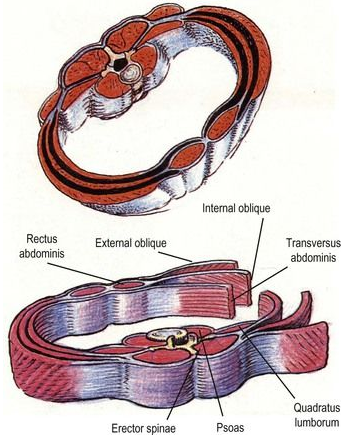 The fascia which travels anterior to the rectus abdominis (that of the external obliques and part of the internal obliques) comprises the abdominal portion of the Stomach sinew channel. Following this fascia superiorly reveals that the anterior fascial layer is continuous with the fascia anterior to the ribcage, especially the sternalis fascia. 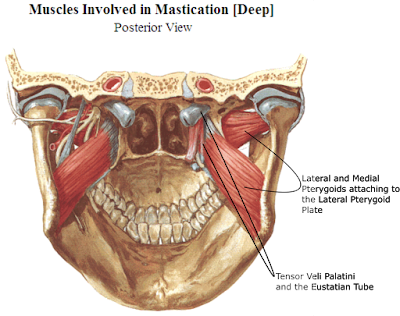 This fascia then connects with that of the sternal head of the sternocleidomastoid muscle (SCM). When this layer is short and tight, the abdomen is often very flat and possibly bowed concave, the sternum is pulled down, and the head is pulled forward. The build of a boxer comes to mind, but I am including an image of Bruce Lee as this is so apparent on him. The tension in the abdominal muscles hasthe capacity to prevent adequate expansion of the abdomen during an inhale and can limit a full breath. The posterior abdominal fascia has a different trajectory, and is continuous with the costal margin attachments of the diaphragm at the inner surface of the anterior ribcage. 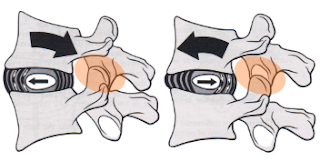 From here, one could follow the diaphragm around to its connection to the lumbar spine. 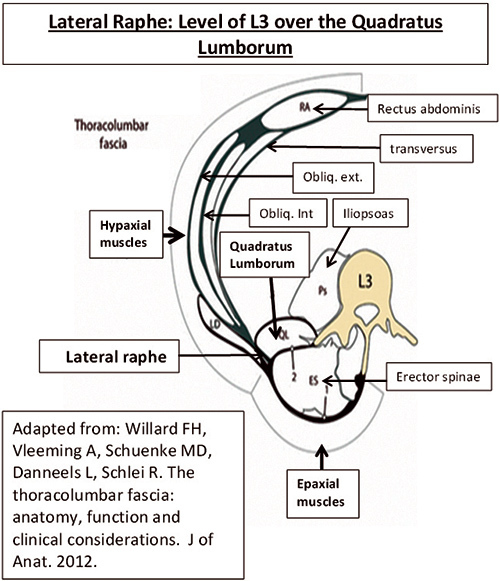 This connection is called the crus (feet) of the diaphragm and connects this muscle to the lumbar spine at L1 and L2 (Fig. 1). This would describe the Spleen sinew channel as seen in Fig. 4. However, one could also follow the diaphragm up to the central tendon (Fig. 1). The pericardium attaches to the central tendon on its superior surface. 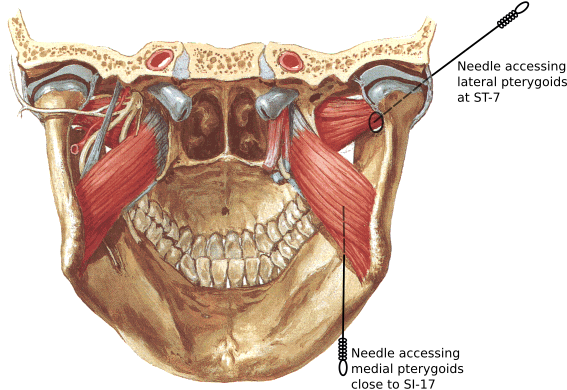 The pericardium is in the same fascial layer which comprises the hyoid muscles. This plane (posterior abdominal fascia-diaphragm-pericardium-hyoids) could be considered part of the sphere of influence described by the Chongmai and accessed through SP-4 (Fig. 5). 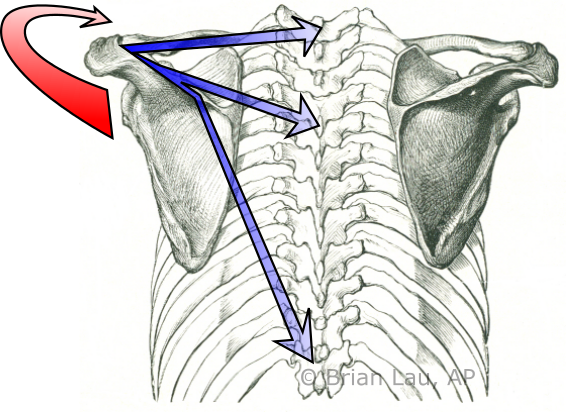 Also included in this layer is the transversis thoracic muscle, an interesting muscle on the posterior surface of the ribcage that shares a similar trajectory to the portion of the Chongmai that disperses in the chest (Fig. 5). For all practical purposes, I consider the Spleen sinew channel to follow this upward trajectory in addition to the attachments at the lumbar spine. And, not surprisingly, SP-4 (paired with PC-6) is a powerful point combination to affect this region. When this layer is restricted, the abdomen is bowed convex and is distended (not unexpected in Spleen Qi deficiency, for instance). Also the solar plexus region is collapsed inward. Often, there is an appearance of someone being punched directly in the solar plexus. Simone Lindner, my fellow faculty member in the Sports Medicine Acupuncture Certification program and a senior instructor with KMI (the program that teaches Anatomy Trains and Kinesis Myofascial Integration), often states that when she sees this pattern, she wonders if, at some influential point in their development, this person had 'their breath taken away'. This could be physical through some direct trauma or emotional. But it is usually pretty deeply seated in their physiology. And, more important to the discussion, it obviously restricts breathing. Patients who present with this pattern generally take very shallow breaths into the belly, with very minimal movement expanding into the chest. It appears that these patients cannot take a full expansive inhale, and are stuck on the exhale portion of the breath. Fig. 6 highlights this, notably the bowing of the abdomen, the collapse of the chest and the general restriction of the ability to take an inhale expanding into the chest. Releasing this posterior rectus abdominis fascia usually is rewarded with a profound release of the breathing and marked improvement in the ability to take a full inhale. This can be released manually by starting at the Spleen channel and insinuating fingers behind the rectus abdominis to reach the Kidney channel and waiting for a release. 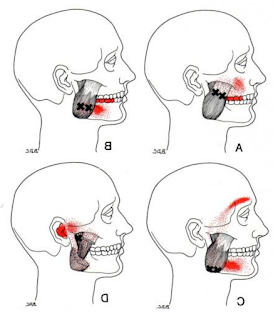 The fascia can also be lifted or dropped depending on the need. Acupuncture needles can instead be used following the same trajectory as the fingers. Upon the release of this layer, the breath is able to move from the abdomen into the chest, allowing for a full expansion in the chest. 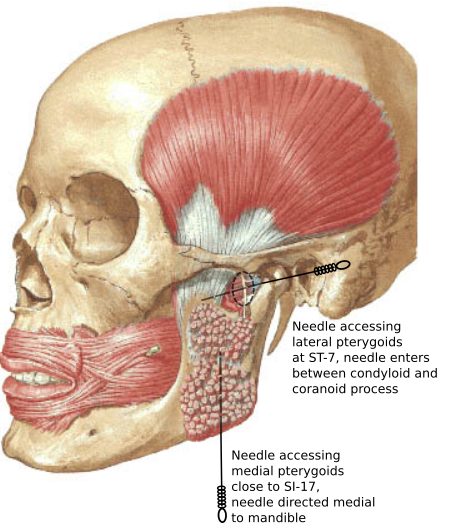 In the Sports Medicine Acupuncture Certification program (in 2016 it will be in Chicago), we cover vertebral fixations and their treatment with mobilization techniques, specific needle techniques at Huatuojiaji points and use of extraordinary vessel points. Fixation at specific levels (certain midback and cervical regions) which are treated with SP-4, PC-6 are understood better by thoroughly comprehending the anatomy explained above. And the treatments described in this post can supplement the treatments explored more thoroughly in these classes. Before moving on to the Liver sinew channel in the next post, it might be useful to note that the abdominal obliques do travel around the body to the lumbar region, and their fascia blends in with the thoracolumbar fascia and attaches to the spine. 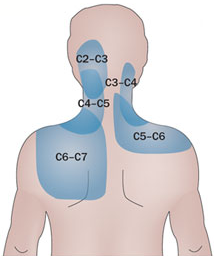 This accounts for the Stomach sinew channel attaching to the spine (Figures 7 and 8). This layer also needs to be open and free for a full expansive breath. 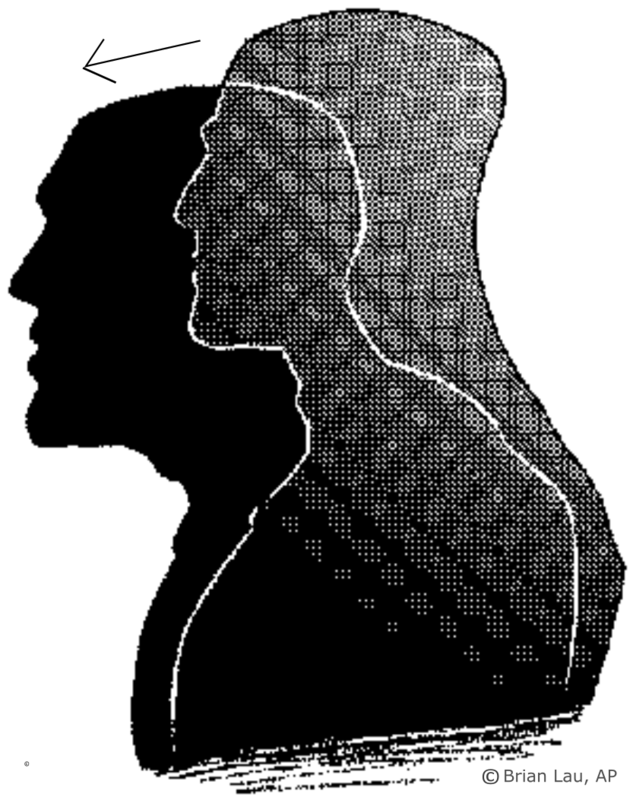 from John Hull Grundy's Human Structure and Shape.